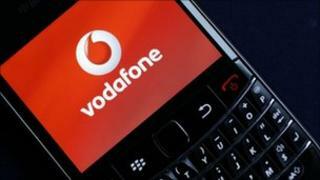 Vodafone's mobile network has been disrupted following a break-in at its exchange centre in Basingstoke. Burglars hit the facility in the early hours of Monday morning, stealing computer equipment and network hardware. Most of the users affected were in the M4 corridor area, to the west of London. In a statement, Vodafone said: "We had a break in last night at one of our technical facilities which resulted in damage done to some of our equipment. "We are working quickly to restore these and will be back to normal as soon as we can." The company added that there had been no impact on the security of customers' private information. One Vodafone user, Leigh Elkins, from Reading, told BBC News that his service was disconnected at around 12.50am on Monday, while he was in the middle of a call. Many angry customers turned to social networking sites to vent their frustration over the prolonged outage. On Vodafone UK's Facebook page, Keri Rampersad asked: "When will this be fixed since this is a massive inconvenience." Another user, Michael Tawroginski wrote: "Who cares about your issue? You should pay for every hour of this problem, or give some extras to all customers affected." Vodafone refused to speculate on whether the break-in could be linked to several high-profile controversies involving the company. It was recently the subject of protests over claims that the firm was let off paying part of an outstanding UK tax bill. Vodafone was also criticised for shutting down its phone network in Egypt during the recent pro-democracy protests, although the company said it was obliged to comply with local laws.